What a pleasure it is to be invited for lunch in France. These Wednesday afternoon (traditionally “off” days for school children) or weekend meals begin with drinks around noon and last well into the 4 o’clock hour, and are even more luxurious when held on the terrace of one’s garden. I might not be a garden- or home-owner myself (yet! ), but the next best thing is having friends who are. My choir bestie Annie, a gourmande for traditional french cuisine, has had quite a time coming up with vegetarian recipes for us to eat when I’m around. Each meal is a surprise and an adventure in one. We nibble on nuts or crackers while drinking our first glasses of cider or wine, then move on to an hour’s worth of entrées and main dishes. We’ve nommed our way through tomato tartes (reminiscent of southern tomato pie, but with decidedly less cheddar), veggie pizzas and lasagnas, stuffed roasted red peppers, and sweet potato soups. A natural pause in the conversation is the perfect moment to bring out the cheese board and homemade bread, and is also when I usually loosen my belt. Desserts and coffee come next, of course, and a quick shot of farm-fermented calvados (for health purposes) revives us for our promenades around town. We always stroll down the local trails, visit nearby châteaux, trespass on neighbors’ property to pet their horses and donkeys, and generally do whatever it takes to work up just enough of a second appetite to return home for a cuppa. 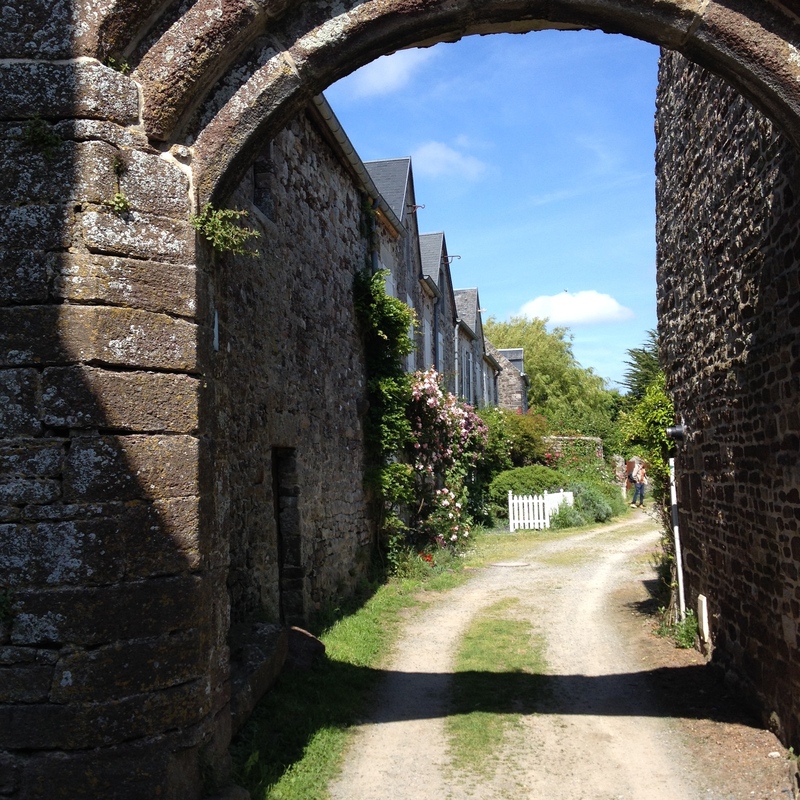 Strolling through a nearby village: Agon-Coutainville. This past Wednesday, Annie and I laid in the garden hammock digesting while the clouds floated above us. Following Annie through her giant English garden always reminds me of walking around my grandmother’s backyard. She died when I was ten, but one of my favorite memories of her is the way she would guide me around the backyard, reminding me of the names of all the flowers, popping touch-me-nots, and watching critters flit around the nearby woods. Annie is a lot like her. She lets me attempt the French names of her beloved flowers, then quietly corrects me when I ask for help. She’s just lovely. After a few hours dozing in the grass, we sat around the teapot and said our goodbyes for the summer vacation; I’m heading back to the States tomorrow for six weeks en famille. It will be wonderful to be back home, of course, but I’ll sure miss the friends (and meals) I’ve made here. I came home from a workout earlier in the week and decided that eating everything in the fridge was a good idea. Behold, my mammoth tortilla omelette, inspired by the delicious Spanish tortillas I ate in Italy. You’ll note that there’s no tortilla bread in the photo. A traditional Spanish tortilla is not, in fact, the magical flat bread you use to hold your burritos together. Rather, it is a cake of fried potatoes piled high and held together with egg in a firm cornbread-like shape. I started by frying two thinly sliced potatoes and some onion in a swimming pool’s worth of oil. 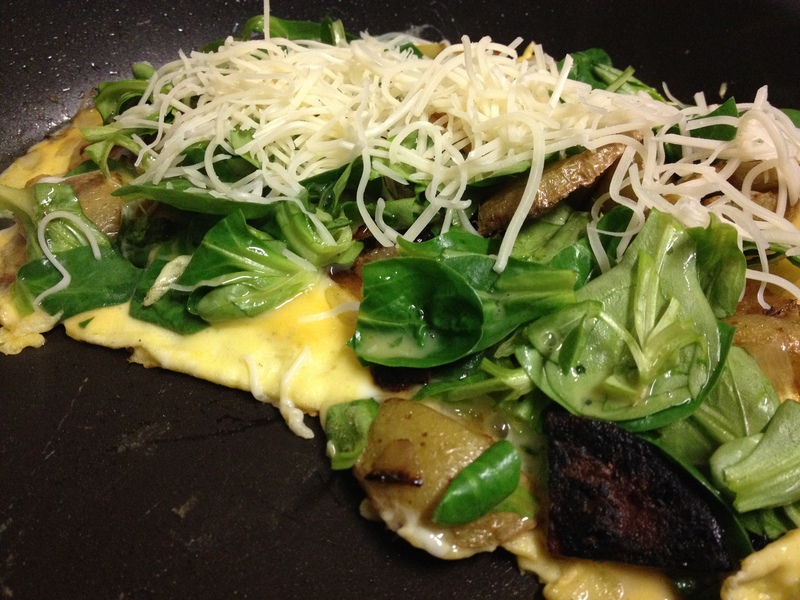 After they were fully cooked and evenly spaced in the pan, I poured in two beaten eggs, added a handful of spring lettuce (this negates any unhealthiness in the rest of the dish), and piled on the emmental cheese for a bit of French flavor. I prefer my eggs runny, so I only cooked it on one side and ate it open-faced, allowing the top to remain deliciously wiggly. And voila: a francophile’s take on the classic Spanish picnic food. This omelette was its own full meal, thanks to the potatoes. The crispy potato skins and slightly burnt onion bits added some texture to an otherwise basic breakfast. Seriously, I noshed down the whole thing in about five minutes and was painfully full but oh so very satisfied. Try it out and tell me what you add to make this dish your own. Buen provecho! We have finally reached Day Five: the final day of our Bon Appétit series here on Kaycee En Route. If you’ve made it this far with me, I congratulate and thank you! Seriously, it means a lot that so many of you have come back day after day to read and comment on this project. 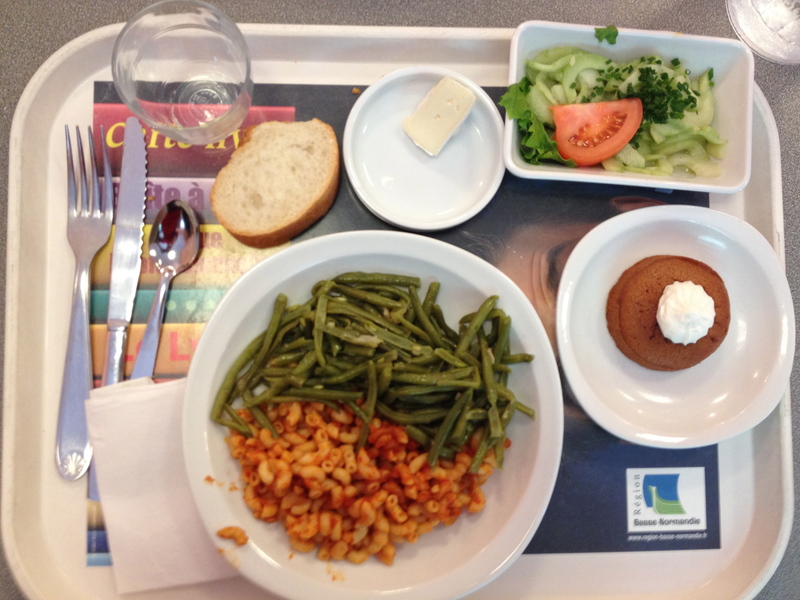 This week, we’ve seen that the French live up to their stereotype of taking long, luxurious breaks for multi-course meals, even in school cafeterias. Old-fashioned dishes are still far more common than quick sandwiches and the like in the country of haute cuisine. Even though fast food has officially invaded France and obesity is slowly increasing across the country, the French still manage to be some of the healthiest people on the planet by staying loyal to their tradition of taking the time to enjoy real food. Children learn that spending time with friends in communion is a vital part of every day. Students sit down to small round tables and face their classmates. They pick up real silverware at the front of the lunch line and serve each other from pitchers of water, the only beverage offered to the kids (teachers get wine and coffee, too). The setting and presentation of the meal is nearly as important as the food itself. All of these details add up to a more familial experience, teaching young Frenchies that les petits bonheurs of life really do matter. As far as the content of the actual plates is concerned, your grandmother was right to say “In all things, moderation”. The majority of the dishes you’ve seen this week have been fresh, locally sourced vegetables and grains, but they were usually swimming in a fair amount of butter. (Keep in mind, everyone else’s plate had some form of meat, as well.) All but the strictest of dieters take a dessert every day. The French enjoy their meals-they don’t feel guilty about eating delicious food or taking the time out of their workday to do so. By allowing themselves that break, they will be happier and the rest of their day will be more productive. They take just as much time to walk around town with friends, spend time with family, and profit from all of the best of life, thereby maintaining a more positive state of mind and overall health. The perfect adjective for the meals and lifestyles that are promoted in France is equilibré: balanced. Here, it seems like you really can have your cake and eat it, too. In honor of the Chinese New Year, today was Vaguely Asian Day in the cantine. Yes, it looks as though the school must have gotten a great deal on carrots this week, but I really don’t mind. The rice was a wonderfully flavorful departure from my usual pasta, and the soy sauce was enough to stave off my Japanese-food-detox shakes for a few more weeks. More important than the food, though, was that I took the advice from the French and savored every moment. I spent a full hour sitting in the cafeteria, listening to my colleagues gossip about students and stacking each finished plate onto another with that satisfying little *tac*. After I pushed my chair back and wished the group an enjoyable fin de repas, I joined my fellow English teachers in the staffroom to sip on our usual tea like the geeky Anglophiles that we are. In the end, it’s less about the dishes served and more about the enjoyment of the most mundane of things: a meal among friends. Again, thanks for taking the time out of your day to read this series. I hope you enjoyed it, and t’hesite pas to send me any suggestions or questions in the comments! And of course, don’t forget to take a moment to do as the French do and enjoy a bite with loved ones today; whether you include the camembert is up to you. Typically the busiest day around school for heaven knows what reason, Thursday in the cantine is a mad sprint for forks and slices of baguette. Shiz gets real. But even though it’s loud and cutlery sometimes goes flying, I’m still more than happy to be there. Why? Teachers at my school pay €2.56 ($3.50 at time of writing) for a balanced, multiple course meal cooked by professional chefs. My soon-to-be-infamous bagel, chips, and root beer cost about the same five years ago. Being the poor little English Assistant that I am, paying 3 bucks a day for a four-course homemade meal that I would never cook for myself is one of the better perks of this job. Yes, I had two kinds of carrots today, but I love me some carrots and it was still better than anything I’d ever find in town. The kebaberie down the street sells ham sandwiches for €4.50 a pop: twice what I pay for less than half the food. If I went for a multiple course meal in a typical French restaurant, I’d be paying at least €20. Yes, it would be rich and sumptuously delicious, but I’m just fine to stay at school and save that cash for travel. If you ask me, French kiddos don’t know how good they’ve got it. As you’ve seen from the past two days, I have no trouble finding enough food at lunchtime and generally am more than satisfied with the many options before me. The exception to the rule is Wednesdays. Every Wednesday across this fair country, all elementary schools are closed and high schools have half days. Because most kids are running for home by 11:55 AM, the cafeteria offers a limited menu to the remaining boarding students and teachers, usually made up of leftovers from the previous day. For the few vegetarians and vegans around here, that means plain grains and less-than-filling meals that frequently lack a protein. 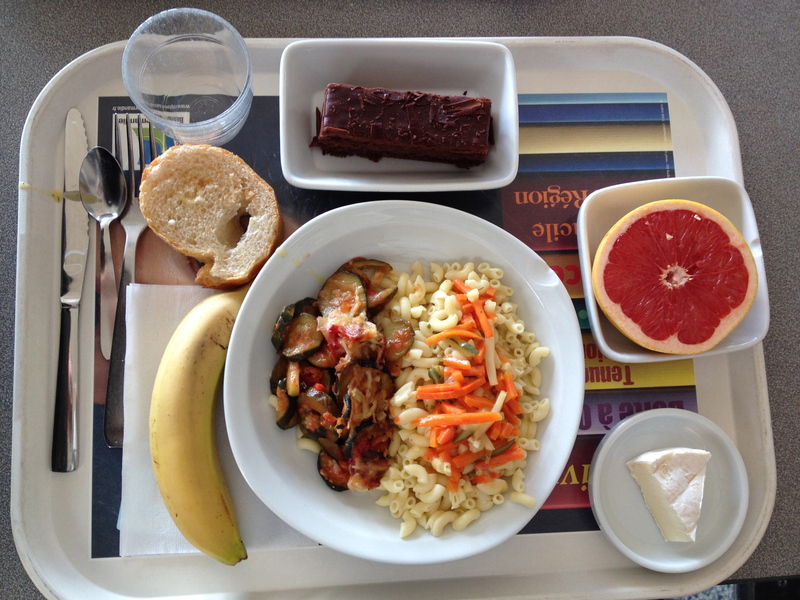 In fact, I tend to skip the cantine lunch on Wednesdays, but I wanted my dear readers to see the difference. It’s easy to see the origins of today’s meal: green beans from yesterday’s side and macaroni that was first bought for Monday’s lunch. It might be less than beautifully presented, but these dishes were still surprisingly yummy and relatively filling, though my rumbling belly would have probably been content with sawdust this afternoon. The green beans reminded me of home, even though they weren’t quite as salty as my family would have liked. (That’s probably a good thing.) Having had camembert cheese three times in as many days, I’m starting to hope for a nice chevre or even emmental for tomorrow. The one thing our cafeteria always gets right is the dessert; the gooey chewy melty caramel cake was perfection on a fork. Do you have any dietary concerns that some people just don’t understand? Gluten-free or vegan people would have a very hard time here in the land of bread and cheese. Happy Tuesday, dear Bon Appétit adherents! For those of you who didn’t have the pleasure of knowing me as a child, I’ll first mention that I was precociously decisive in terms of taste an insanely picky kid with no tolerance for anything with a sauce, cooked in a casserole dish, or green. I could survive for months on end on cheese roll ups and Frosted Cheerios. This was not the fault of my dear mother, who did everything she could to prevent my dad’s insufferable eating habits from rubbing off on me, but all my own. Sorry, Mom. Once again, not my mother’s fault or the fault of my school. I attended a private, religious K-12 school in an affluent part of L.A. (Lower Alabama, that is). The school cafeteria always offered a hot meal, though most kids went for the hamburgers, french fries, and chicken sandwiches that were on offer every day, or brown bagged it. Bags of chips and soda or sports drinks were the usual sides. My brother, for instance, was perfectly happy to eat the Pizza Hut that our school had delivered in bulk every day. Not the healthiest of foods, but at least he was getting in the necessary calories. Kids don’t really have the choice to be that difficult here in France. Take a look at any restaurant menu, and you’ll notice a distinct lack of a kids’ section. If one does exist, you won’t see grilled cheese or chicken nuggets; you’ll find smaller portions of the kitchen’s regular dishes. People might have a preference for certain types of cheeses or other very specific tastes (i.e. I don’t like mustard), but I have yet to meet someone with the wide-ranging “pickiness” that so many American children have. Today’s lunch was about as far from my high school experience as possible. I’m proud to have graduated from my mini bagels. From the salad dressing to the (heaven forbid) touching ingredients in the puff pastry and the slimy mushrooms, this meal would have been absolutely off limits not so long ago. Let me know what your usual school (or work!) lunch is in the comments below, and don’t forget to read the questions that were posed under yesterday’s post! I’m very excited for the first day of this Bon Appétit series. 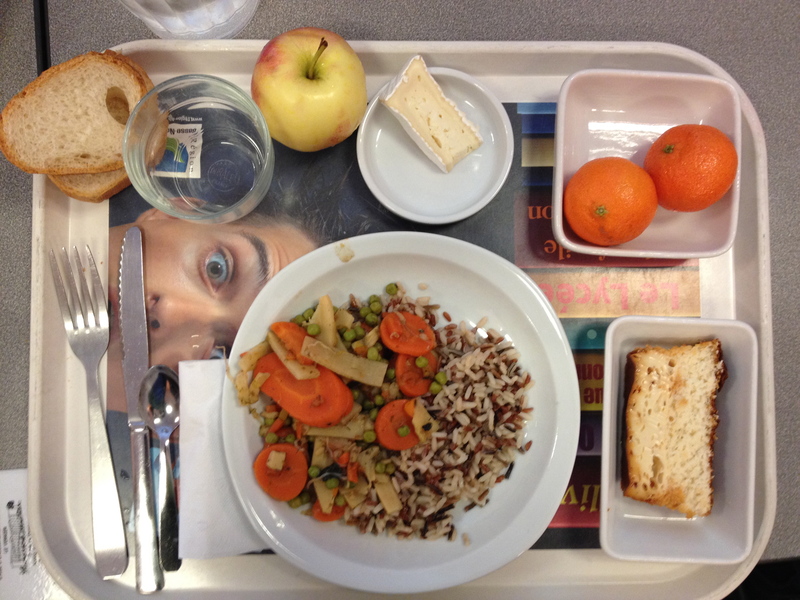 As I mentioned yesterday, each day will highlight my own lunch as well as one facet of French school lunches. Let me know what you’d like to hear about in the comments below! 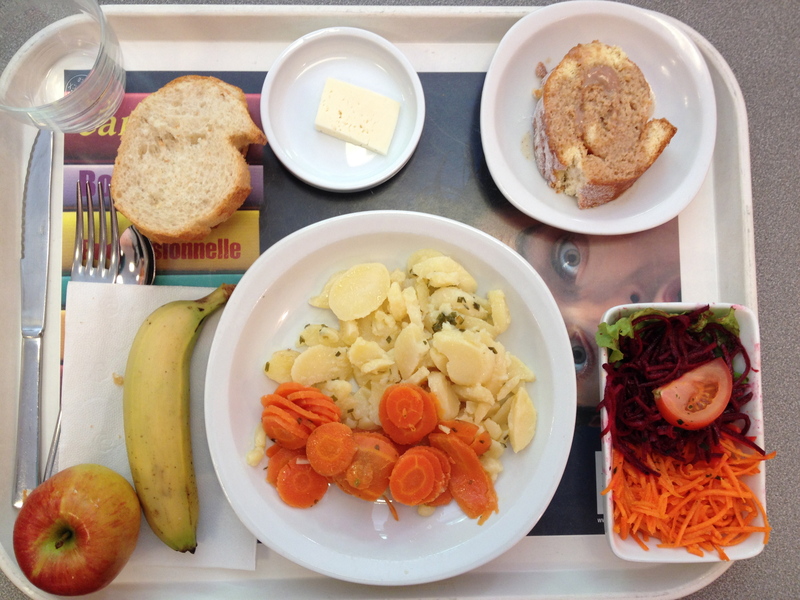 First things first: what is lunch in France? Lunch is typically the biggest meal of the day, eaten between noon and two o’clock. If you happen to stroll along a typical French sidewalk between these hours, you’ll find yourself in a ghost town. Shops, offices, and any other businesses (besides cafés, of course) will feature a locked door and a small FERMḖ sign. Le déjeuner truly is sacrosanct in French culture as the time of day for everyone to pause and enjoy a nice meal with family and friends-even on weekdays. In a typical high school cafeteria, students line up to collect a tray, water glass, and silverware before circling around to the food. The school chefs, professionally trained experts in French cuisine, serve the hot main course. This usually consists of a choice between meat or fish (which somehow doesn’t count as meat here) and three side items. Then, they keep sliding that tray along the line to pick up a choice between two or three cold sides, desserts, cheeses, and fruit. Everyone’s favorite station is the giant basket where slices of fresh baguette are dumped into piles for the taking. And finally the main attraction: today’s meal! Note the various little dishes dividing each course. The French love the order and regularity that comes with eating food in separate courses. They get a strange satisfaction out of sliding each new plate directly in front of them while making a little “tac!” clicking sound to indicate a new act in the performance of the meal. Most people eat an entrée, or appetizer, before moving on to the main dish, cheese, fruit, and dessert. (You read correctly; the entrée is the first course, not the main. Anglophones have been getting it wrong for ages.) Personally, I like to save my fruit for an afternoon snack. I hope you’ve enjoyed today’s edition of Bon Appétit! 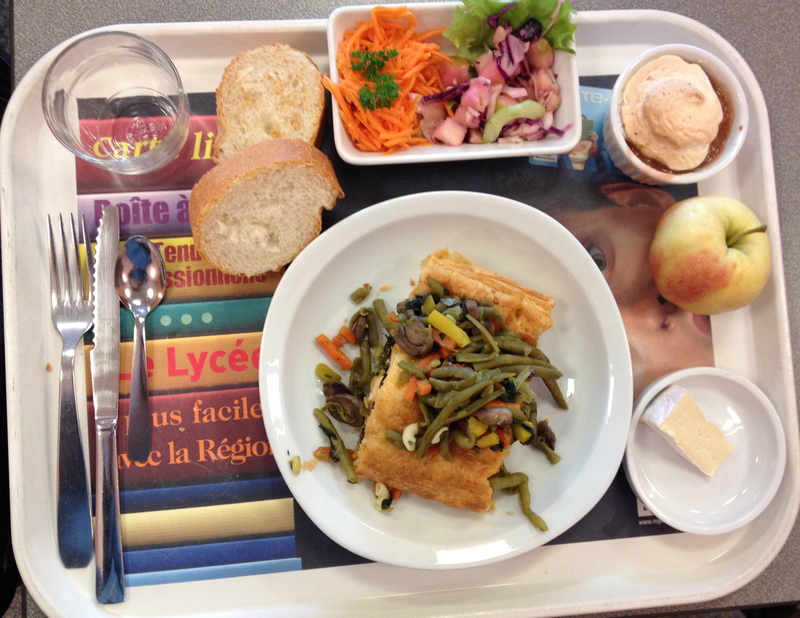 Again, let me know what you’d like to learn about French lunches and if you think you’d enjoy eating in my cafeteria! Enter your email address to follow this blog and receive notifications of new posts by email. It doesn't require a credit card, your SSN, or even your first-born child. I promise.